Whenever modeling magnetic fields in steady-state, transient, or frequency domain with the AC/DC Module, we want to reduce the size of the model as much as possible to minimize the computational resources and time needed to solve the model. Today, we will introduce the three types of symmetry boundary conditions that you can exploit in your modeling and show how to use them. 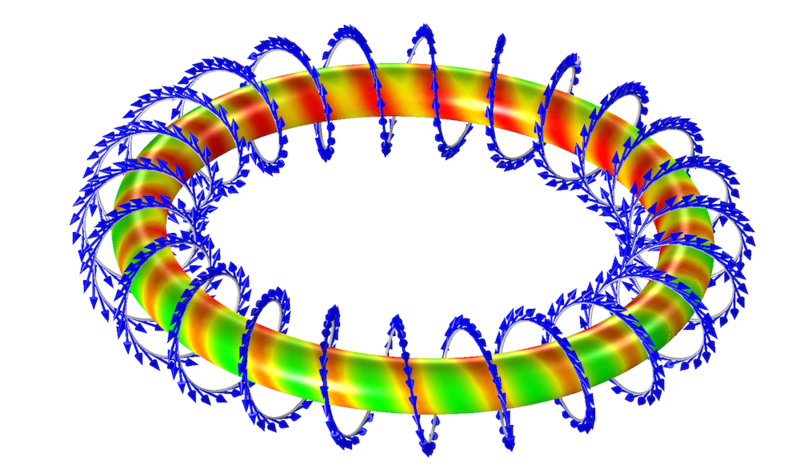 First, let us look at a rectangular wound multi-turn coil, as shown in the figure below. 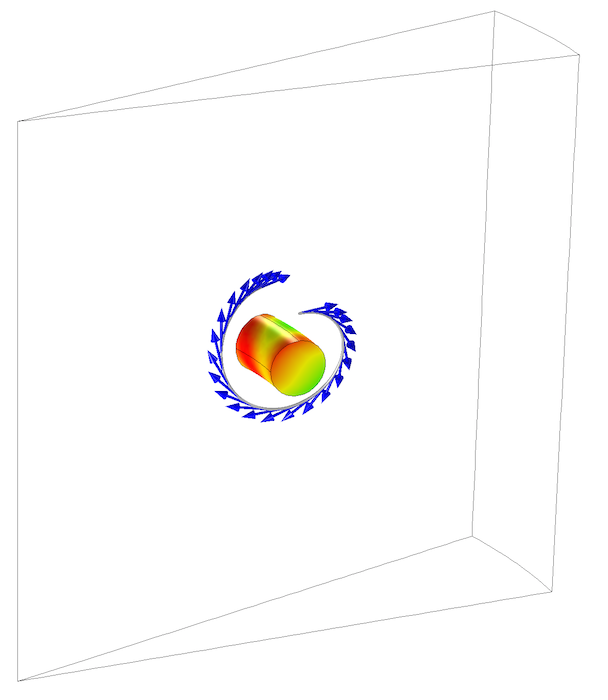 A spherical modeling domain contains a rectangular coil. The coil domain represents several hundred turns of wire wrapped around a rectangular profile. The lead wires that excite the coil are neglected from the model, and we treat the coil as a closed loop of current. The Multi-turn coil feature is used to compute and apply a uniform current distribution around the profile of the coil, and the steady-state magnetic field is plotted. Note that the coil domain has a constant cross-sectional area as we follow the path of the current around it. A rectangular coil with current flowing around the winding direction. Current flow (blue arrows) and magnetic field are plotted. This modeling domain has three planes of symmetry, i.e. planes about which the geometry is exactly mirrored. Let us now see how we can use this geometric symmetry as well as our knowledge of the magnetic field and what direction the current is flowing to reduce the size of our modeling domain. 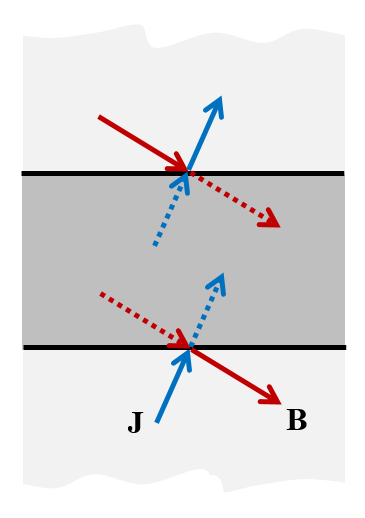 The Magnetic Insulation boundary condition represents a mirror symmetry plane for the magnetic field. The magnetic field will be exactly mirrored as you cross the plane. 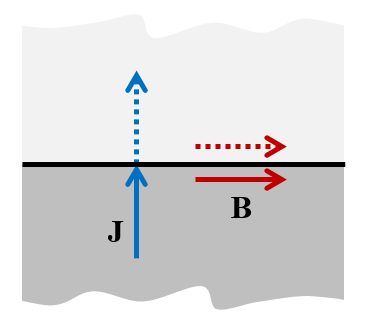 The Magnetic Insulation boundary condition — “cut perpendicular to J and parallel to B“. The Perfect Magnetic Conductor boundary condition, on the other hand, represents a mirror symmetry plane for the current. From a mathematical point of view, it can be thought of as the “opposite” of the Magnetic Insulation boundary condition. The Perfect Magnetic Conductor boundary condition — “cut perpendicular to B and parallel to J“. The original geometry can be reduced in size to a one-eighth model representing the original geometry. Orthogonal planes through the center of the coil are used to partition the domains as shown below. A one-eighth symmetry model of a rectangular coil with current flowing around the winding direction. The Magnetic Insulation (magenta) and Perfect Magnetic Conductor (cyan) boundary conditions are applied along the appropriate symmetry planes for this problem. 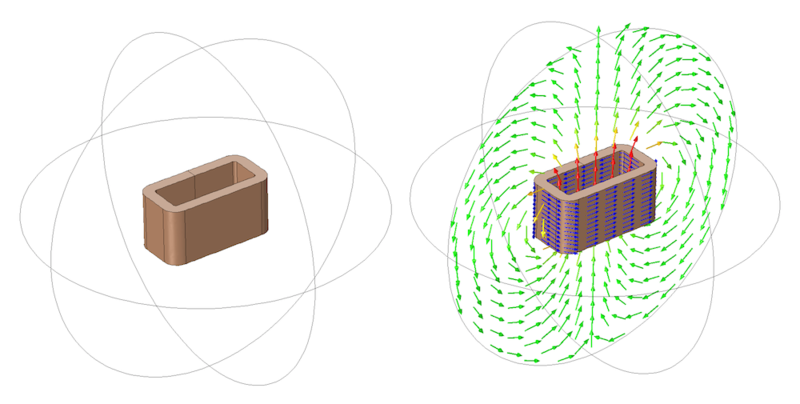 The Magnetic Insulation boundary condition is applied at the two boundaries representing the planes through which the current will flow normally. If the coil is excited with a voltage boundary condition, it is important to reduce the voltage by a factor of two for each Magnetic Insulation symmetry condition applied. If the coil is excited with current, the applied current does not need to be changed, but the postprocessed coil voltage should be scaled by a factor of two for each Magnetic Insulation symmetry condition. The Perfect Magnetic Conductor condition is used at the plane along which the current will flow tangentially. Since the Perfect Magnetic Conductor condition cuts the coil in half, it is important to divide the applied current in half when a current excitation is used. On the other hand, if a voltage excitation is used, then the postprocessed coil current must be scaled up by a factor of two for each Perfect Magnetic Conductor symmetry plane. In almost all cases, the Magnetic Insulation and Perfect Magnetic Conductor boundary conditions are sufficient to significantly reduce the size of your model. As we saw earlier, these conditions enforce the current and magnetic fields to be either normal or tangential to the boundary. But what if we have a geometric symmetry plane where the fields do not have such a symmetry? In such cases, the Periodic (boundary) Condition may be appropriate. The Periodic Condition is used when all we know is that the solution must be periodic. The Periodic (boundary) Condition allows for more general symmetry where both the current and the magnetic field vector can be at an angle to the boundary. The usage of this condition is limited to cases where the magnetic sources as well as the structure are periodic in space. Typically, the full geometry can be reduced to the smallest repetitive element, a unit cell, limited by periodic conditions. Consider the structure of a toroidal inductor wound with a single strand of wire, shown below. The wire can be modeled fairly accurately as a single continuous spiral around the toroid, as long as we again neglect the asymmetry due to the lead wires. We can model the wire as an edge current, flowing tangentially to the wires. A spirally wound toroidal inductor. The arrows (blue) indicate the direction of current flow. The magnetic field in the core is shown. To exploit as much symmetry as possible here, we can consider the unit cell that is just a small slice of the original model containing a single turn of the winding. The Periodic Condition is used along the sides of the slice. When using this boundary condition, the mesh must be identical on the periodic faces, so the Copy Face functionality should be used to ensure identical meshes. As we can see from the image below, the size of the model can be reduced by the number of windings, greatly reducing the problem size. Periodic Conditions can greatly reduce the model size for certain geometries. The generality of the Periodic Condition comes at a price compared to the more basic Magnetic Insulation and Perfect Magnetic Conductor conditions. As it links the unknown fields on one side of the geometry to those on the opposite side, it makes the system matrix more dense and expensive to solve. Therefore, do not use it if the more basic conditions apply. 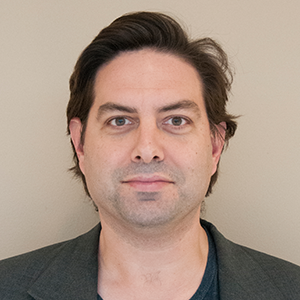 By reducing the model size, we also reduce the computational requirements significantly. In fact, computational requirements grow exponentially with problem size, so the more symmetries that we can use, the better. Even if you don’t have symmetry in the full problem that you want to solve, it is often advisable to work with a smaller model that does have symmetry in the initial developmental stages of your modeling. Walter, this post motivated me to explore periodic boundary conditions. Do you have a model of the toroidal inductor that I can download? Although we don’t have a full example model of this situation (yet), please contact COMSOL Support and we can make a sample file available for you. Thanks for the great article. I was wondering how these boundary conditions can be expressed in terms of magnetic vector potential. From the above, how can one prove that this forces the magnetic flux density vector to cut the boundary at right angle? Also, I am having trouble figuring out what the Magnetic Insulation boundary condition corresponds to. Is it a Dirichlet boundary condition? If yes, is it n ⋅ A = 0, or just A = 0 ? If it is the former, I can see how the magnetic flux density is zero in the normal direction to the boundary and non-zero in the tangential direction. These are indeed some very interesting questions, I would suggest a textbook on computational electromagnetics if you’re interested in an extensive discussion about how these conditions are formulated. The COMSOL documentation and the equation view will also show you what equations COMSOL is implementing. I am trying to solve a problem involving permanent magnet and would like to take advantage of all symmetry planes, but this boundary condition seems to be available only for the other ACDC physics. Thanks for a very clear explanation of these boundary conditions. Is there any way to combine Periodic condition with symmetry boundary condition in RF module? For an example, imagine that instead of one coil, there is an array of coils and we would like to see the Magnetic field. Using Magnetic Insulation and Perfect Magnetic Conductor boundary condition we can calculate the field for only one coil while we know that the field is periodic. Is there any example that uses Periodic boundary condition with Perfect Magnetic/Electric Conductor ? In the application library i was not able to find any. There are many examples on periodic boundary conditions (Modeling of Pyramidal Absorbers, Frequency selective surface, hexagonal grating…) but in none of them the electric/magnetic field symmetry has been considered. Would you please let me know if there is any documents or example ? It is not quite clear what you meant here by combining the periodic condition with the symmetry condition. I believe that, for what you’re describing, a set of periodic coils stacked in parallel, you could simply use the PMC condition on the symmetry plane. My question is slightly irrelevant but I am facing great difficulty in how to apply a constant Magnetic field of 1.5 T along the propagation of light while finding the absorption cross section of gold nano sphere in RF module. My aim is to find the effect of Magnetic field on absorption. Yours suggestion will be greatly appreciated……. Your response will be greatly appreciated . Fascinating blog article, very intuitive! It worked well for my EM resonator problem. However, can I ask a question about the result visualization? Utilizing the symmetry, only part of the whole structure needs to be constructed, but also only that part will be simulated and have data. Is there a way to map (eg. electric field mode profile of) the simulated region to those unconstructed region and get a full plot (of overall mode profile)? There are Mirror operations within the Results > Data Sets branch that will allow you to visualize the total solution. Thanks for the article. I have a question which is not quite relevant though. While working with Magnetic Field(MF) physics, if I scale down the geometry (Geometry>Length Unit> cm) to millimeter or micrometer then the solver fails to solve. Even I downloaded some running models from COMSOL website and scaled down the geometry to centimeter and those models also suffers can’t solve. Do you know any solution to the problem? I will appreciate any suggestion. I’m having trouble getting my solenoid inductor to run in ACDC module, its just taking forever to compute or won’t compute. By more expensive what did you mean by that? I was trying to decide if this was worth trying.